V bets half pot. 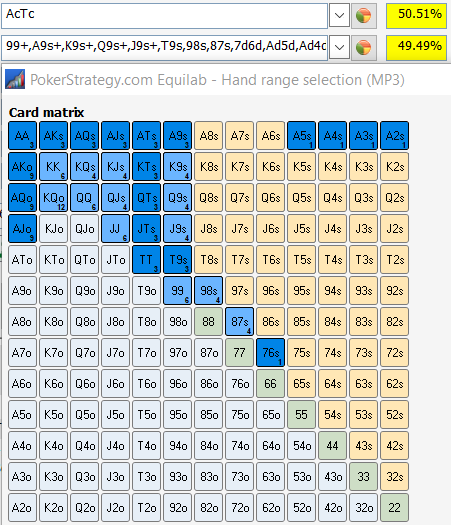 The board is very wet and hits V’s opening range hard so i put him on this Cbet range. Q: Should I raise this turn? A: I asked my self in the game this question because I improved to a nut flush draw but after this analysis the answer is NO! It looks maybe week that V bets only half pot here but this board hits very well villains range and we can not hope to make him fold on river if we miss. We also have a lot of equity and have the right odds to call and V could decide to shove vs my raise and I have to fold a lot of equity. On the turn another important factor to consider is our SDV – when we got a pair + FD in general i would not start aggression with a c/r on turn. Cause now we actually do beat some of his draws that bets, therefore less good to turn our hand into a bluff. Yes it’s true that we got more equity when we also got a pair however i would not say it’s a reason to fastplay. I would say 24-27 bbs, i don’t really want to OB in this spot cause i still want him to call with 1p hands aswell.